Looking for a crowd pleasing, easy breakfast? This Breakfast Frittata with bacon, tomato and cheddar cheese is full of good flavor and nutrition. This breakfast frittata casserole is low carb, low sugar and gluten-free. It’s also high in filling protein. A delicious healthy breakfast choice. This Delicious frittata pulled my son-in-law out of bed. I texted him to come eat breakfast this morning. He loaded Kayti in truck and drove right over! I sent him pictures. Those bacony smells grabbed him right through the phone!! I sent him more pictures as the frittata was getting smaller… and smaller. Dave and Evan wouldn’t wait! Brian arrived just in time to finish it up! A 9×13 pan of frittata quickly became a lovely, bacony, breakfast memory. And there were only 5 of us. Frittatas and omelets are great way to use up a bunch of eggs and bacon in a hurry. This Tomato, Bacon and Cheese frittata is low carb and gluten free. And it uses Leftovers! Put in anything you think will add flavor. Out of tomatoes? Maybe you have salsa instead? . Onions, garlic even celery will be great in this recipe. Just cook these in with the bacon before adding them to the mix. What else have you got hanging about in the fridge? It just might be an excellent addition. This egg frittata recipe is very simple to make. The versions you can create are infinite! My Sundried Tomato Kalamata Olive Frittata is an example of that. I have used many leftovers up in this egg casserole for both dinner and breakfast. Get creative with your spices too! 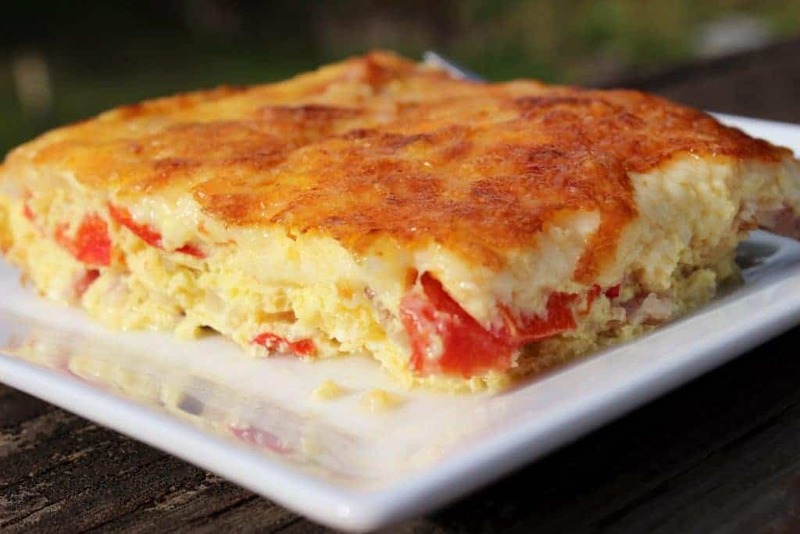 This fragrant eggy dish is filled with bacon, tomatoes and cheese, and your favorite veggies. Make this low carb frittata for a crowd of hungry people. This filling baked frittata is attractive and appetising in a pie plate or casserole dish. All it takes is chopping the veggies. Cooking the bacon on the stove before baking is important too. You want it completely cooked before adding it to the frittata for perfect texture and flavor. We went years and years without bacon on our menus. Dave insisted on avoiding the bad chemicals that bacon contains. Sodium nitrites in particular. Now you can find bacon without the nasty additives right in the local grocery store. Are struggling to find good sustainably sourced non processed smoked bacon and other meats? Try butcher box(referral link). Find a good local brand in your area for natural smoked meats if you can. It’s So worth it to support local farmers. Read this article on Natural Uncured bacon for more information about why uncured smoked meats are best for your family. Find a source for good quality uncured lower salt meats. Put bacon back into your diet. Bacon and eggs=Happiness. This Frittata Recipe is an awesome way to enjoy both! This frittata recipe is low carb. With about 9 frittata carbs per serving as the recipe is written. You CAN make it even lower carb by replacing the milk with heavy cream. Low carb veggies will also lower the carbs in this recipe to make it a keto frittata. 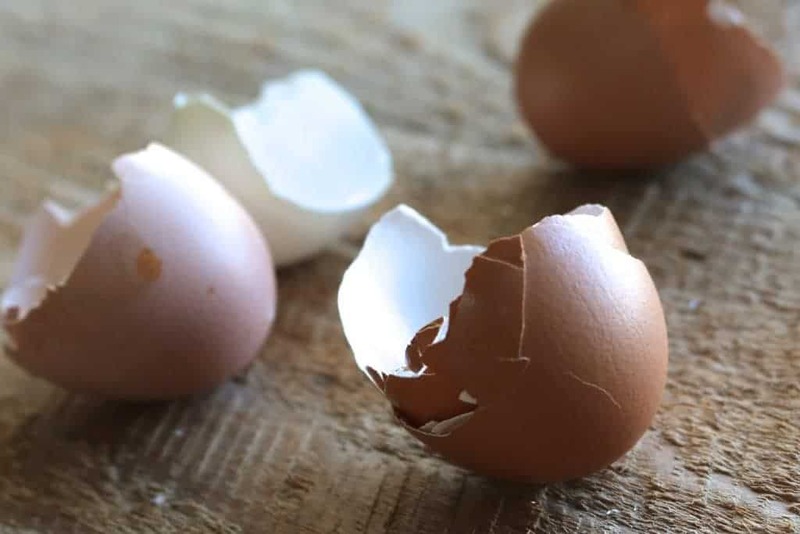 Eggs are naturally high protein and fat with little carb value. They are always a great choice for low carb dieters. Bacon is perfect for building the flavor and sustaining fats a keto frittata recipe requires. Your home will overflow with yummy bacony breakfast smells and fill tummies with a scrumptious low carb egg frittata. Enjoy! If you purchase items from our affiliate links we may receive a small commision at no extra charge to you. Thank you for supporting Homemade Food Junkie. This breakfast frittata recipe also makes an excellent main dish for a brunch or light dinner. Just add a delicious Spring Berry Garden salad with Creamy Balsamic Dressing or Muffins for breakfast like our Creamy Pumpkin Muffins. Our recipes archives are full of great muffin ideas for you. A crowd pleasing, easy Breakfast Frittata full of good flavor and nutrition. This low carb, low sugar and gluten-free breakfast is also high in filling protein. A delicious healthy breakfast choice. Preheat oven to 350 degrees F (175 degrees C). Lightly grease a 9x13-inch baking dish or deep dish pie plate. Place chopped bacon in a large skillet and cook over medium-high heat until evenly browned, about 10 minutes. Add in the onion, garlic , fresh herbs and pepper. cook until tender, about five minutes. Drain bacon and vegetable pieces on paper towels. Beat eggs, milk, salt, and ground pepper in a bowl; pour into prepared baking dish. Sprinkle with vegetables, fresh tomatoes, bacon, and Cheddar cheese. Bake in preheated oven until a knife inserted near the center comes out clean, 25 to 30 minutes. Cuisine: American / Category: What's for Breakfast? If you enjoy this recipe please let us know in our comment section. Please Rate this recipe and share it with your friends. Thank you and have a great day! How lovely to have your own fresh eggs! Your Breakfast Fritatta looks and sounds delicious! Thank you for sharing it with us at the Hearth and Soul hop. Sharing! Made this for breakfast. It was yummy!